Practical information to help immigrants settle into everyday life in the United States, also civics infomation that introduces new immigrants to the US system of government. Quick start information on: U.S. 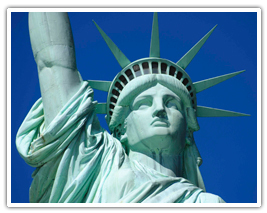 Citizenship , Green Cards, Passports, INS Forms and U.S. Citizenship Test. Helpful Federal resource links A-Z navigating new immigrants to the adoption of a new American life. Links available in multilanguage. Forms, news, resources, laws, outreach, plus information on green card , citizenship, working in the US, adoption, family. Links to USCIS alerts, employment verification, and locating an USCIS office. US Dept. of Justice website on immigration appeals and review. Submit a complaint, find legal representation, immigration court, forms, and more. User-friendly information on immigration law from Legal Database.com, links to Green Card Lottery, immigration attorneys, legal forms, advocate groups, plus US Census Bureau and more. How to apply for social security number and social security card, change a name on the card, card replacement, S.S. benefits and application forms. Social Secuity Online in Multi-language. Public information materials translated into several languages from Arabic to Chinese, French, Italian, Korean, Polish, Russian, Spanish, Vietnamese and others. Free interpreter services on request available, call 1-800772-1213, Mon-Fri, 7AM-7PM.